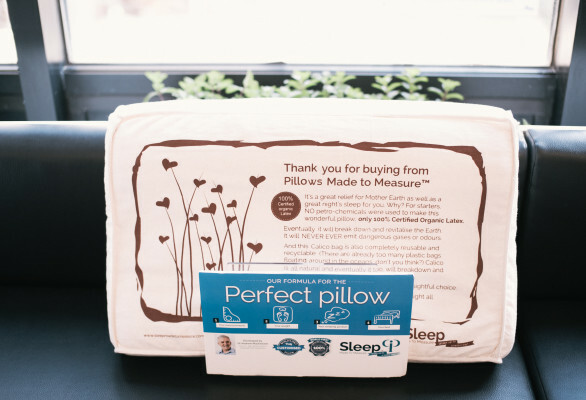 For the best night’s sleep of your life, we now offer bespoke pillow measuring and fitting services, in collaboration with Sleep Made To Measure; the world’s only 100% certified organic and carbon-neutral custom latex pillow brand. Our fully-trained team will take detailed measurements of your shoulders and neck, and ask you a variety of questions about your sleeping habits and any underlying issues – for example, current neck or back pain. This information is then sent to Sleep Made To Measure, where it will be used to create your bespoke pillow. Your pillow will typically take around 10 working days to arrive, and once we receive it, we’ll arrange another fitting consultation with you to ensure that it is right for you. We’ll discuss sleeping habits, positions and any current pain issues, offering suggestions and advice on improvements that you can make to ensure that your body and spine are perfectly positioned for a refreshing night’s sleep. Our made-to-measure pillow and fitting services are available by appointment only. Please contact us in order to book a time slot.